Rather than being self-sufficient, Shinoda Taro only considers his sculptures complete when they have been placed in a specific environment or context. 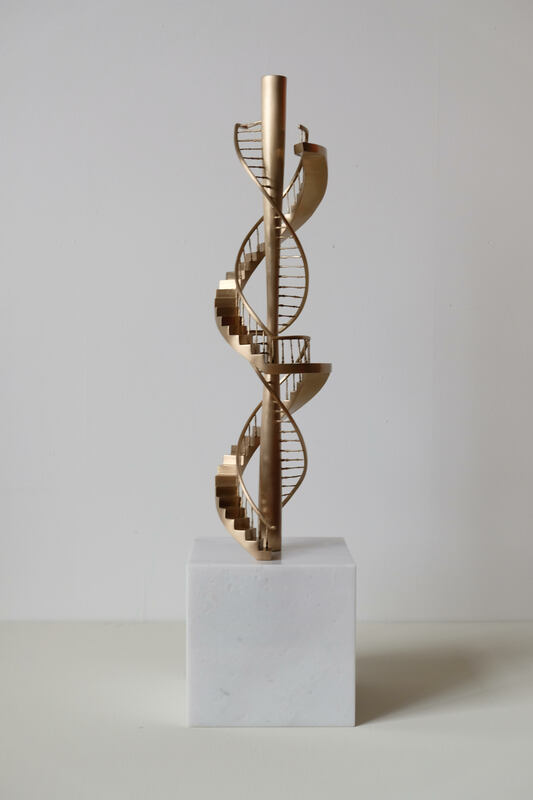 Inspired by the discovery of an unused spiral staircase at Auckland Art Gallery, Shinoda conceived of a column-like sculpture that would pass through the spiral, realized in situ and relating to the building. He also envisaged an identical column-like sculpture to be installed outside the venue. Although both sculptures have the same form, one is incomplete because it is outside on its own, while the other is complete because it is installed within the spiral staircase where it has a complementary relationship with the building. This project has yet to be realized, but small-scale model of the sculpture is exhibited. The Paper Poem series by Jae-eun Choi, who was based in Berlin, Germany from 2010 to 2016, consists of collages the artist made using flyleaves, endpapers and other blank pages extracted from books produced in the 19th and 20th centuries. Paper produced in the late 19th century and a large part of the 20th century is affected by exposure to light, which bleaches its edges over time. The delicate gradations of overlapping bleached pages brought together inside Choi’s frames are like layers of time stacked on top of one another. The compositions, which are reminiscent of constructivist collages, enhance these natural gradations, while also appearing much like a bird’s eye view of a city, with buildings alongside one another. Collage exists at the boundary between two- and three-dimensional artwork, and Jae-eun Choi’s collages are transformed into memories and continuity through the concept of time, suggesting that the pursuit of our very own lives originates from a never-ending cycle. Kawamata Tadashi produces many drawings and maquettes as part of his process when creating site-specific work at venues throughout the world. As the artist turns lines into manifest form and increases the scale, his drawings and models presage the works that will eventually be realized once he has finished exploring and trying out different approaches. This process allows the concept of each sculpture to grow. The exhibition presents works intended as sculptural interventions for cities that address urban conditions and transformations, including a relief of People’s Garden (D9) Plan #7 (1992), which was created for a project at Documenta 9 in Kassel, Germany.